Ecuador has turned into another place that I underestimated. In my plans I have just two weeks set aside for this naturally beautiful country. In a short time I’ve seen a lot but, as always, there’s a lot more to see. I’m writing this post from perhaps the most beautiful place I have stayed yet but I’ll save that for part two. The capital of the country, although at first not as historic as Cartagena or as cultured as Bogota, has its own unique appeal. The hostel I stayed in, The Secret Garden, has amazing rooftop panoramic views which gave me the perfect spot to see all the sights. 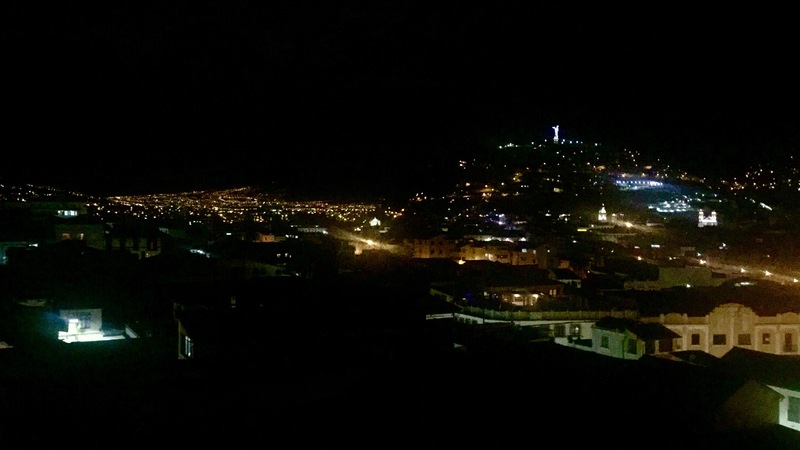 Quito is situated in a valley between large mountain ranges and has the appearance of a long, bustling centre. 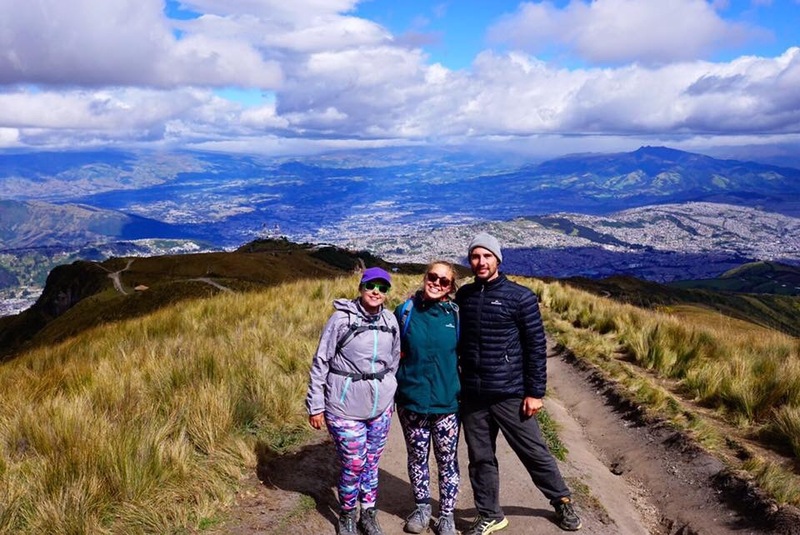 On my first day in the city I joined an active group of travellers from my hostel taking the TelefériQo (cable cart) and climbing Rucu Pichincha behind it – although at first I thought it was just a three hour hike. Well this turned out to be my hardest physical test since Roraima. Combined with altitudes over 4,600m and strong winds, there were certainly points where I didn’t think I would make it to the top and points where I didn’t even want to. But the views from here were even better and the sense of achievement at the end was extremely rewarding. The company during the five hour hike (it was three to the top!) also improved the experience. Take gloves though, if you plan on venturing there yourself! On my second day I was hit with my first upset stomach, halting my plans and preventing me from doing to walking tour. 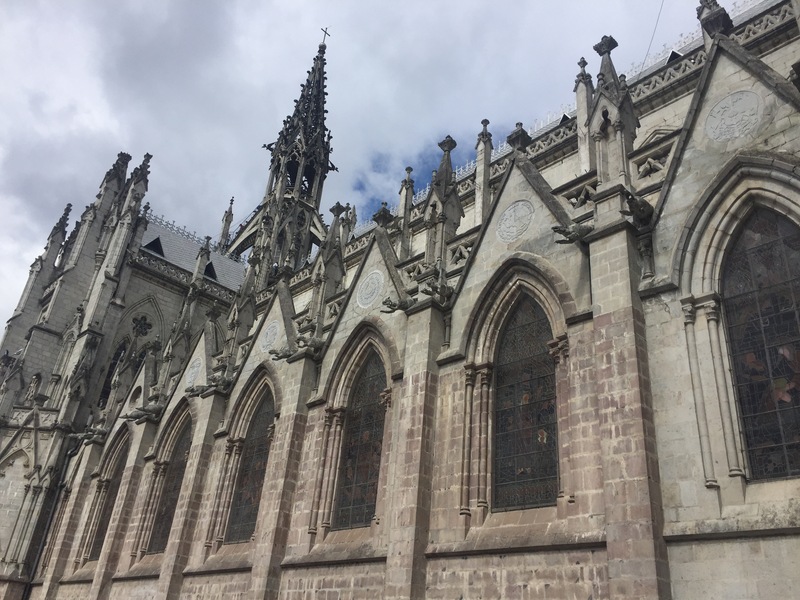 This meant I didn’t learn much about the history of the city but I did manage to see some of its many churches and the main plaza – a picturesque, tree-lined square with benches and restaurants facing inwards. 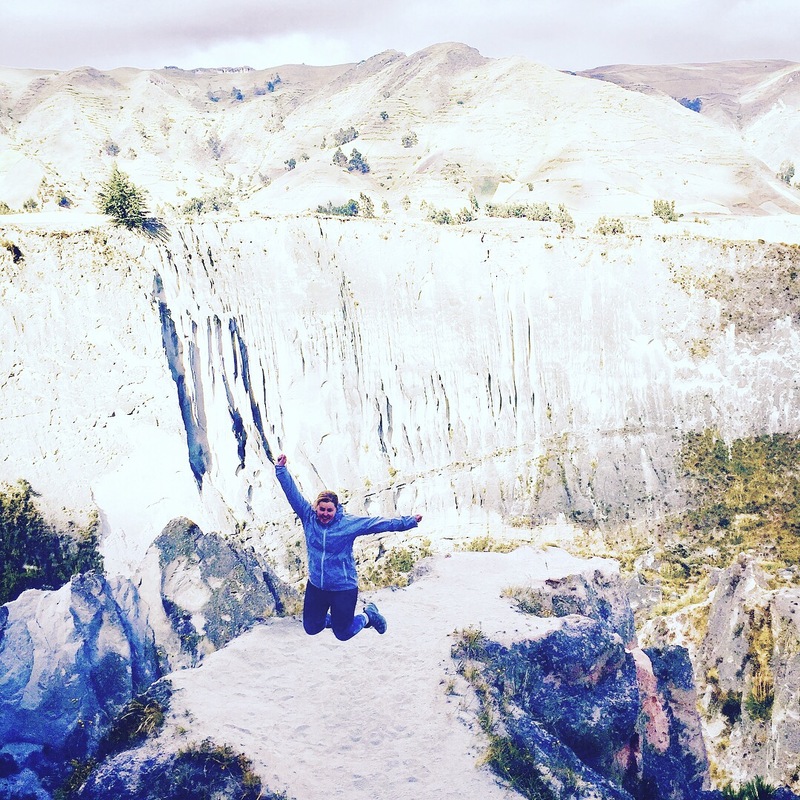 The day off did give me time to make plans for the rest of my time in Ecuador, including a day trip to Quilotoa. 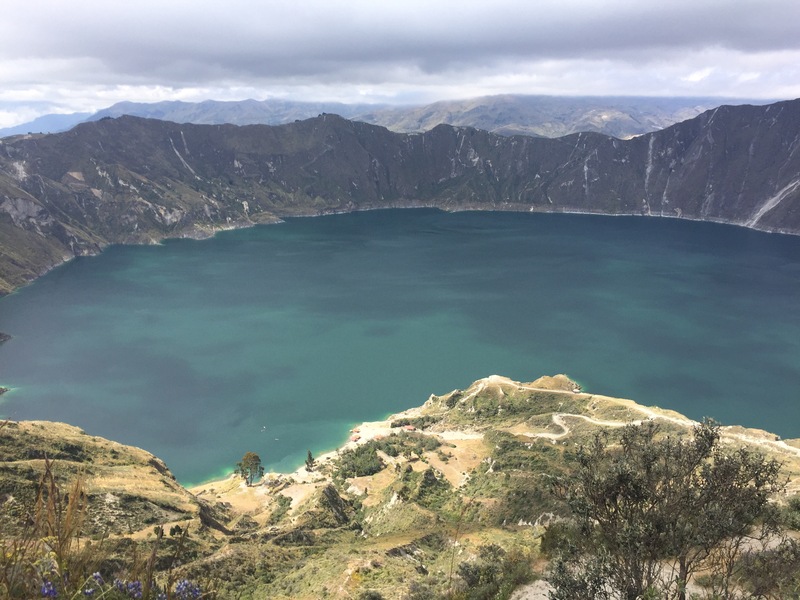 Quilotoa is another famous volcano in Ecuador. 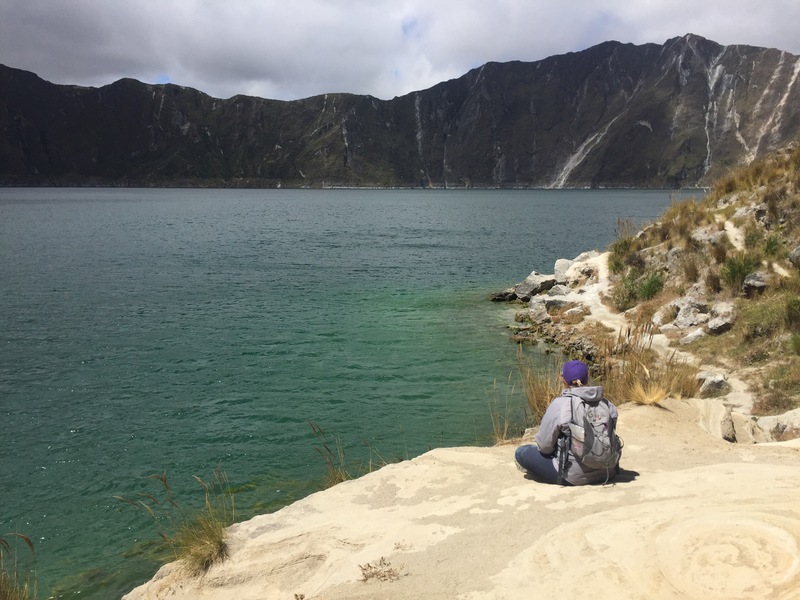 Many travellers spend three days hiking the Quilotoa loop around the rim of the volcano’s crater which is filled with the most beautiful, blue-green lagoon. I didn’t have enough time for this and with an upset stomach decided it wouldn’t be wise to try. So instead I signed up to the day trip run by the travel agency beneath the hostel (CarpeDM). This has definitely been my best spent $50 so far. The day started early with a long drive, a stop off for breakfast and then a further drive to two animal markets. 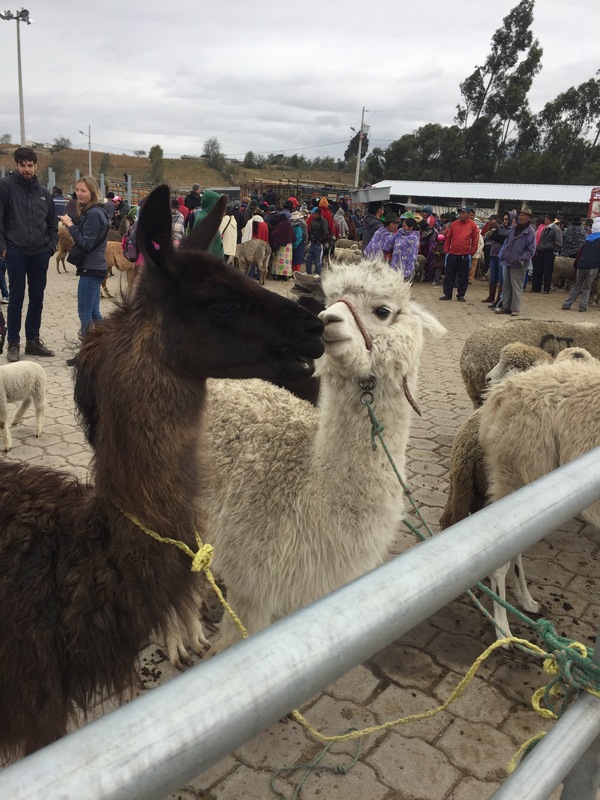 First we visited a large animal market selling pigs, cows, alpacas, goats and lambs. This was quite disturbing and the vegetarians in our group certainly struggled with the sight. The next market was for smaller animals including guinea pigs (a popular delicacy in South America), chickens, ducks, puppies and cats (I hope the last two weren’t for eating). I was less shocked by this market and although visiting both wasn’t a fun experience, it was an interesting one. After this we had another hour of driving before reaching the top of the volcano’s crater. It was very windy when we got there but this didn’t detract from the fantastic view. The pictures show just how breathtaking the crater and lagoon was. I was expecting to be slightly disappointed by the reality, having seen a lot of pictures before. But this wasn’t the case, in fact I think the view is even better in the flesh. The water was so bright and clear, even with a few clouds hanging around the edge of the crater. We took the walk down into the crater at a steady pace, making it down the to water in about half an hour. There was a real sense of calm just sitting down by the water’s edge. There’s a small wooden pier you can sit on and take pictures. We sat here for a while just enjoying the tranquility. After another half an hour our time was up and we needed to climb back up the crater. The altitude was still really high here so it wasn’t all that easy. I went for a slow and steady speed with few breaks and made it to the top in 48 minutes. At the start of the three hour journey back to Quito, we stopped off to take pictures at a canyon which was another little bonus of the trip. This is the second inclusive trip or tour that I’ve paid for and I’m really glad I did. 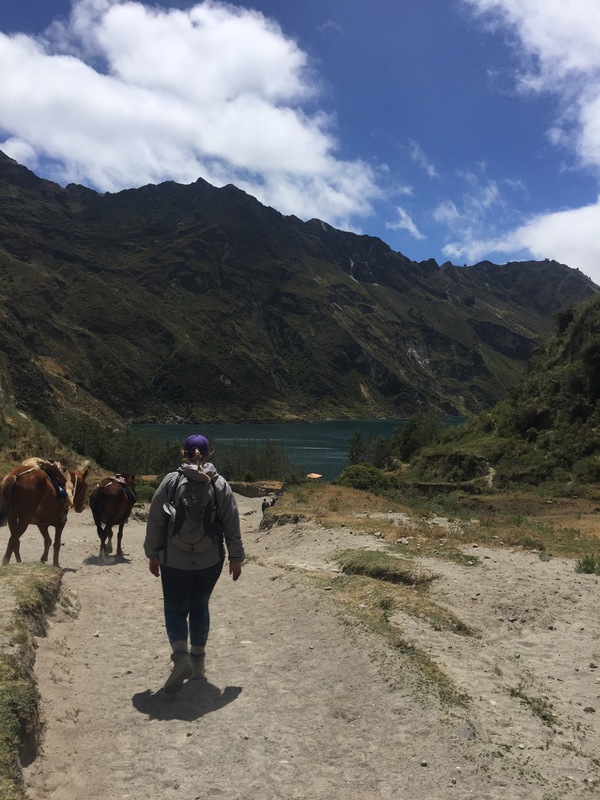 It was definitely good value for money and it meant I could see a part of Ecuador that would have been hard to fit in on my own. Highly recommended! Next I went to Mindo, a small town set up for tourism two hours north east of Quito. I spent one night here, splashing out to a hotel instead of a hostel, which actually felt kind of quiet after weeks in hostels. 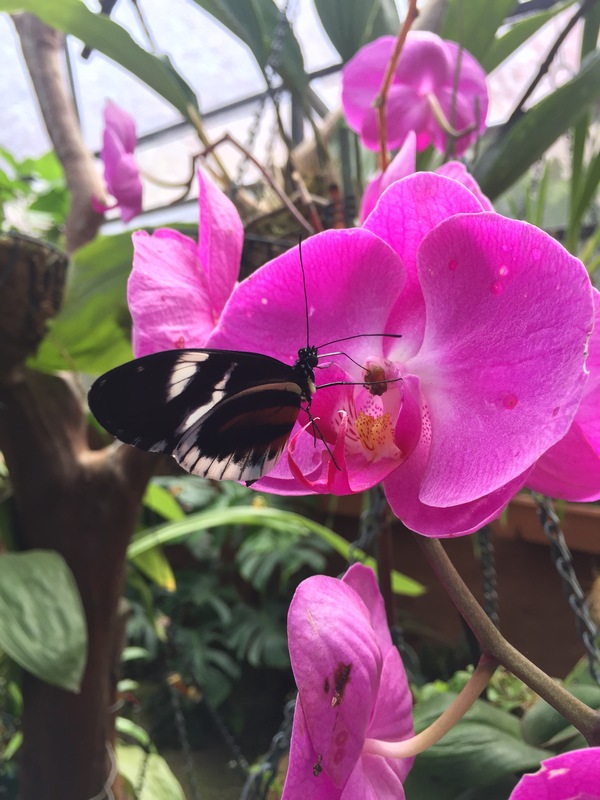 As soon as I stepped off the bus I was ushered into a tour operators office and straight into a taxi to the butterfly farm. 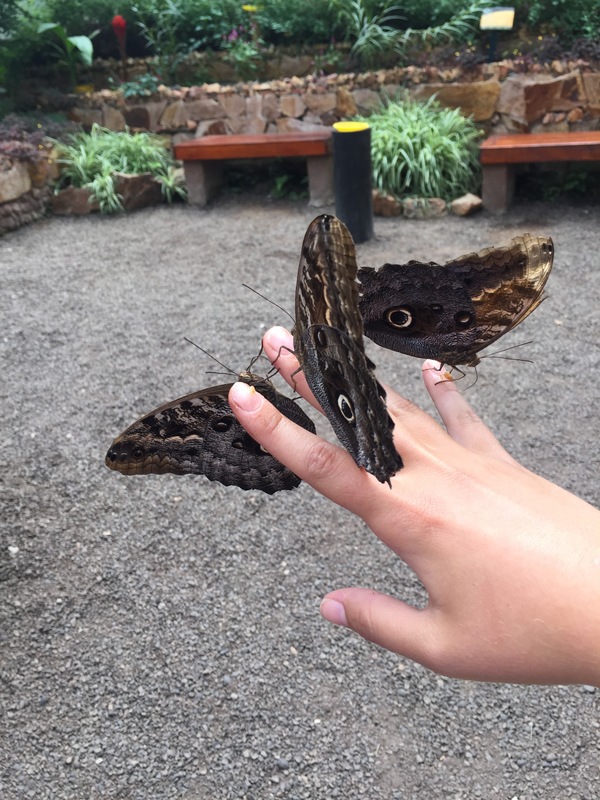 The butterfly farm was the main reason I wanted to go to Mindo as I’d never really heard of one before and I think butterflies are so pretty. All the posters in town had these giant blues butterflies on them and I really hoped I would be able to get a picture of one myself. The farm was a lot smaller than I expected but it didn’t disappoint in anyway. 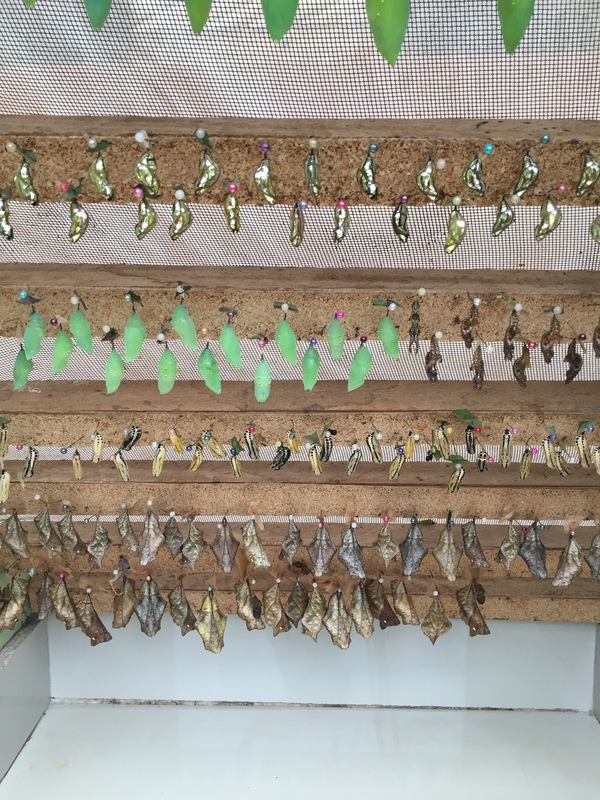 The compact room just meant it felt like there were more butterflies. They had these small trays with mushed banana which you could dip your finger in and pick up the butterflies by their body. I even managed to balance three on one hand for a while. 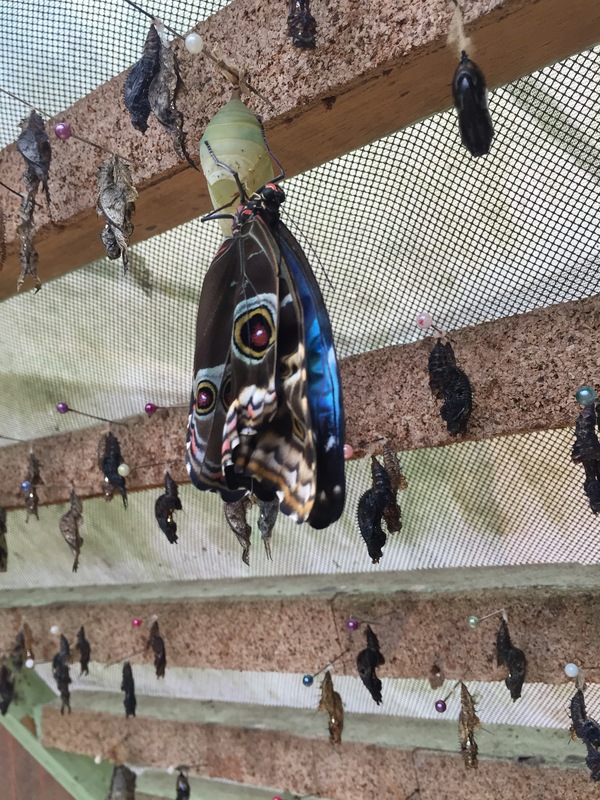 They also had all stages of the butterfly lifecycle on display from egg to caterpillar, chrysalis to baby butterfly emerging from its shell. 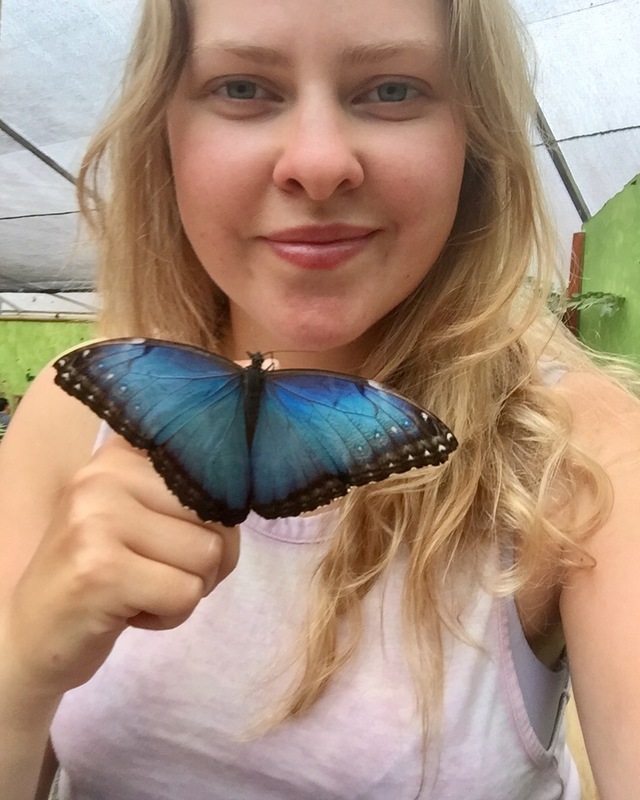 I spent over an hour there taking pictures and videos, finally determined to get a picture with a blue butterfly by my face (mission accomplished). After this I went for a late lunch at The Beehive restaurant (a huge plate of fajitas, blackberry juice and a hot chocolate) and went to my hotel to relax and read. A few naps later I stepped out again for dinner, via the small main square where a dance class seemed to be going on. It was an usual sight as people of all ages joined in and I later realised this was my first experience of Reggaeton. Not adventurous to join in, I grabbed a great handmade pizza nearby and went back to the hotel for an early night. 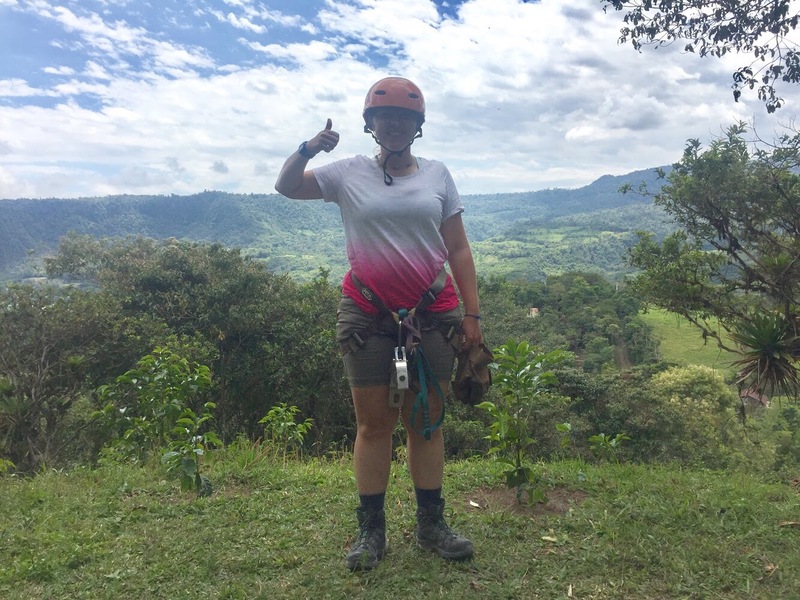 The next day I decided to try the ziplining with Mindo Canopy Adventures. And it was awesome! 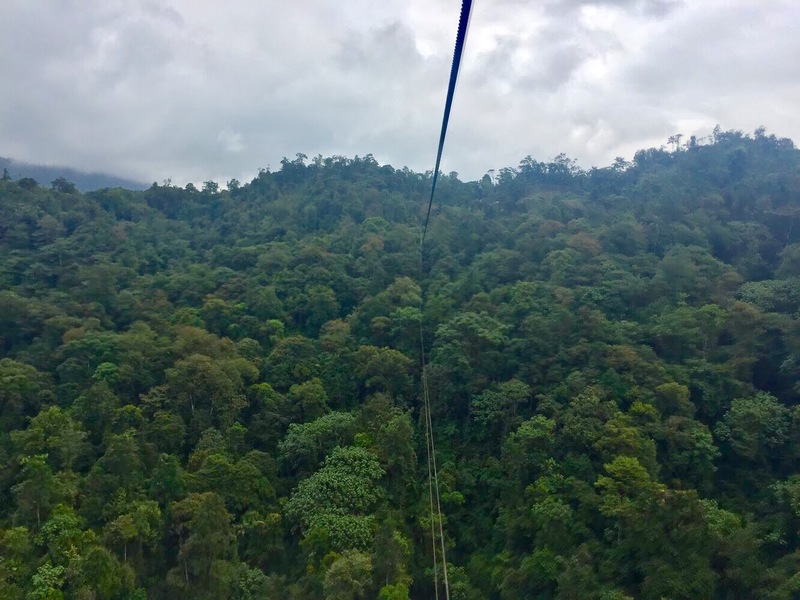 Not a small course, the ten lines send you hundreds of metres across the cloud forest canopy. I even felt brave enough to try the superwoman and mariposa (butterfly) positions – the latter where you fly upside down. I went back to The Beehive for lunch (a burger this time) and then visited one of the chocolate factories for a tour and excuse to eat lots of free samples. 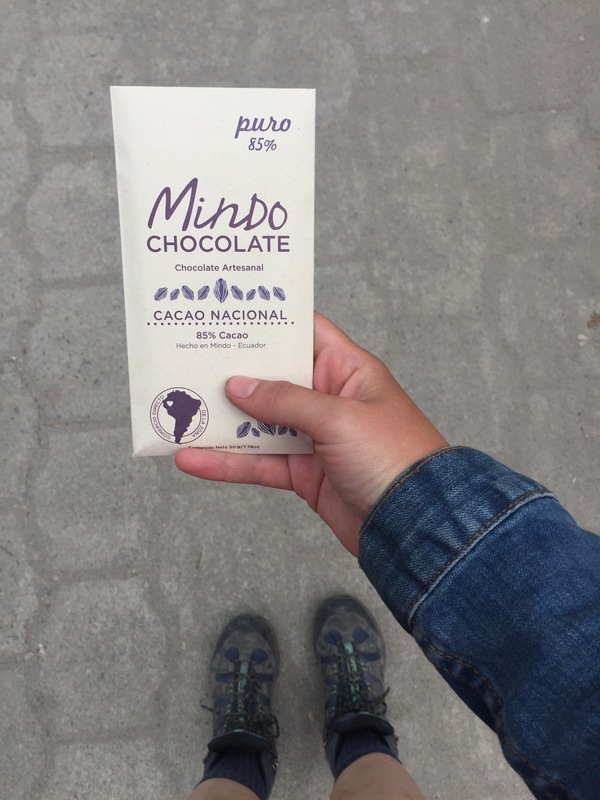 It was similar to the chocolate museum I visited in Cartagena except they had real-life examples of cocoa trees, cocoa beans and the drying process. 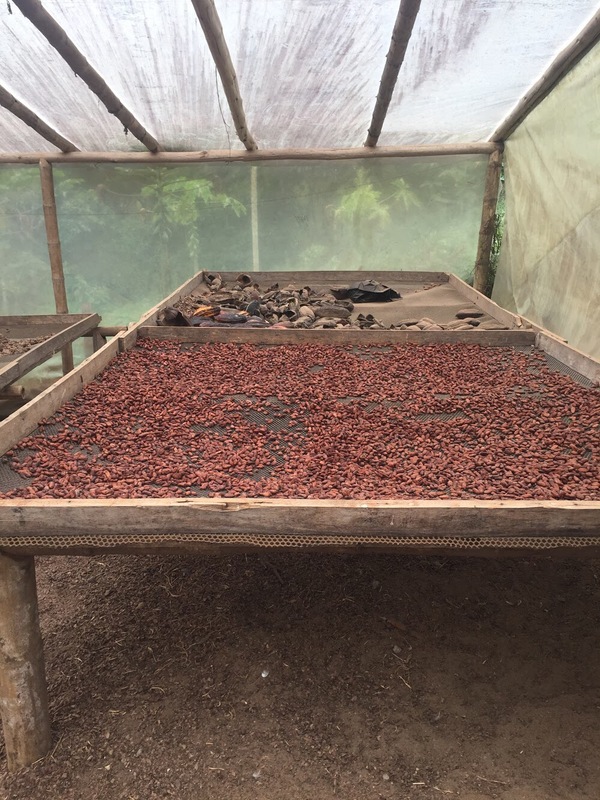 It was great to learn even more about chocolate as I’m quite a fan and they had a coffee tree too so I could see what the beans looked like as they grow. I had to leave a little early from the tour to catch my return bus to Quito but I left feeling I’d had a great time in this touristy town. 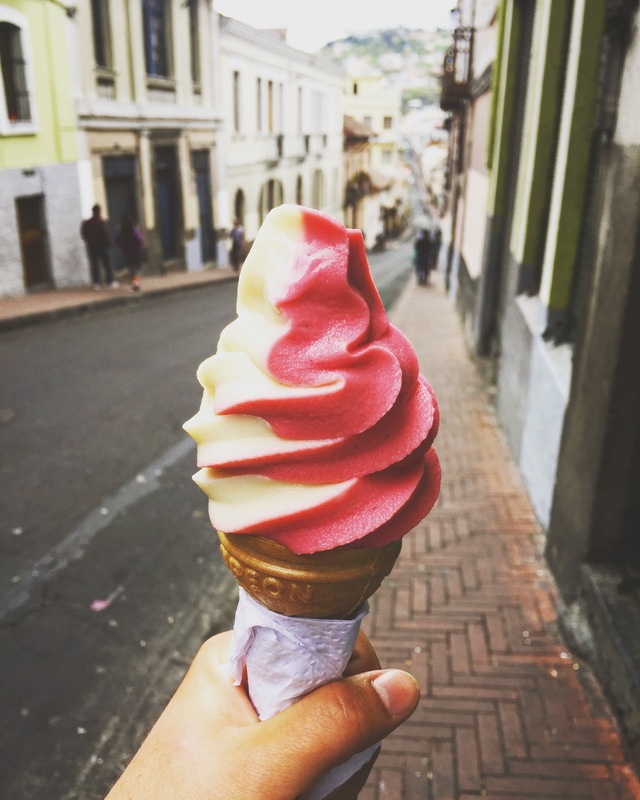 One day left in Quito, I had to try the helado (ice cream which is offered by servers at every street corner) and visit the famous Basilica de Vito Nacional. Well the ice cream was so refreshing I had two. 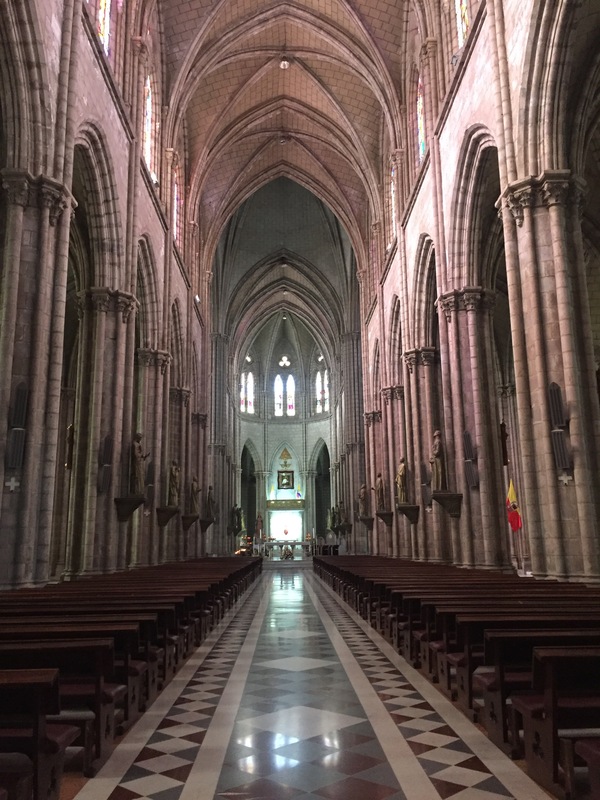 The Basilica deserves it’s fame, it’s an outstanding sight to see inside and out. You can even climb up one of the towers but I decided not to. Instead of gargoyles, the outside of the gothic church is lined with turtles, iguanas, alligators and other unusual animals. 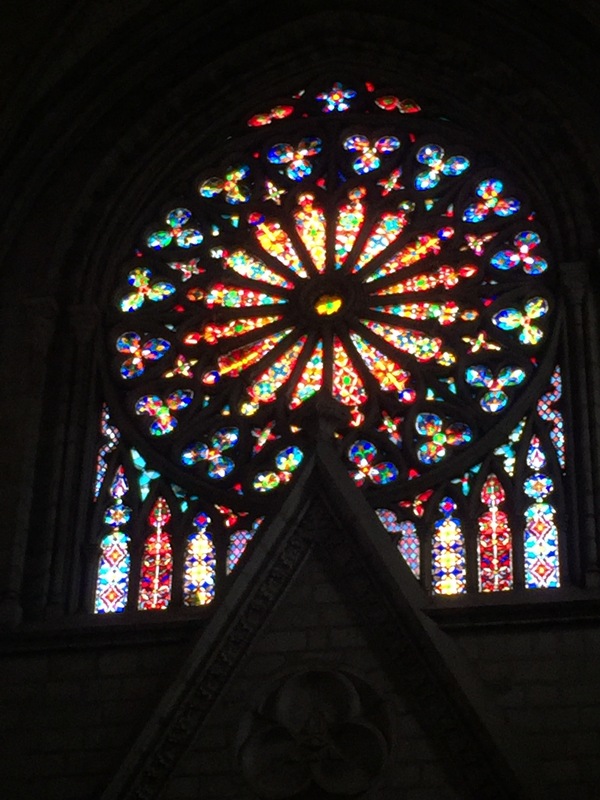 The inside is lit by bright and colourful stain glass windows at all ends. There’s also a small chapel behind the alter dedicated to Mary and it’s decorated with more ornate windows and colours. I’m really glad I managed to fit this in because it’s probably the most impressive church in the whole of the city. All this I’ve seen in just one week! 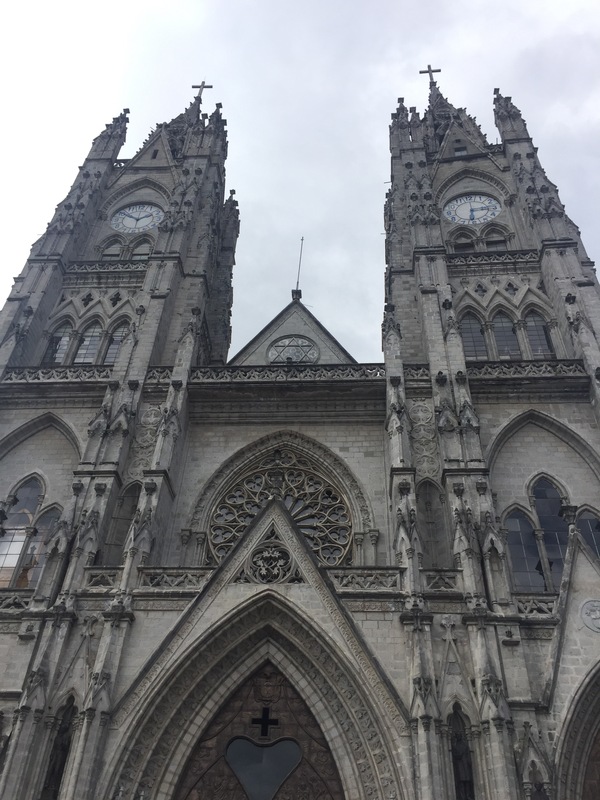 Ecuador has so much to offer and I’ve still got another week coming up. 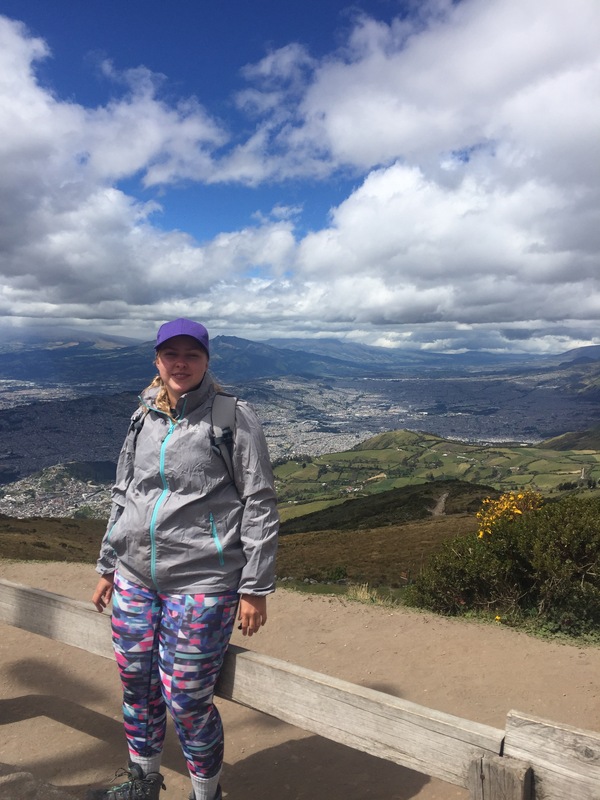 I’m writing this from Cotopaxi, a very ‘zen’ place to relax and hike. Next up is Baños and Cuenca before I head onto Peru. I promise I’ll get another post up before the end of the week. The moral of the story, be prepared because Ecuador should not be underestimated!